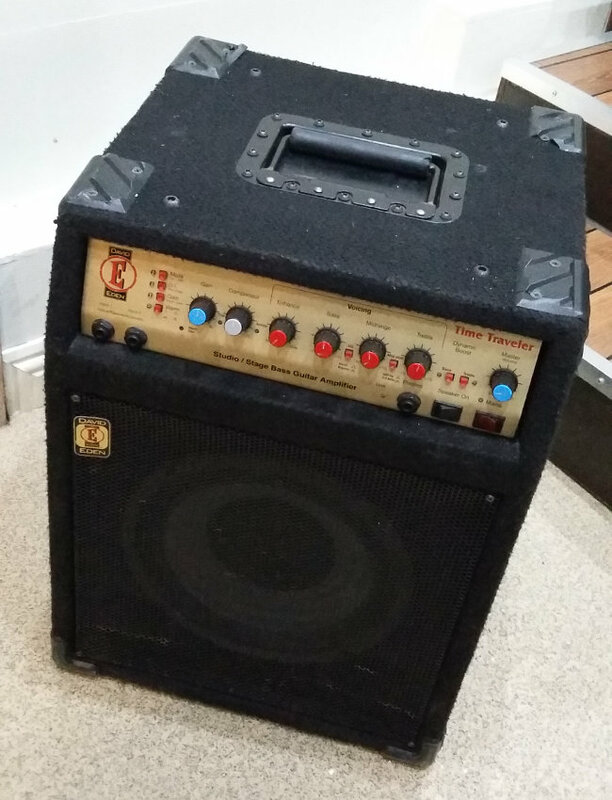 My Eden cxc110 bass combo amp is a trusty and versatile workhorse I’ve used on hundreds of gigs over the last 12 years. The single main speaker is only 10″, but the combination of skillful voicing and powerful amplifier gives a very dark tone. As long as you don’t push it too loud, it’s an ideal amp for smaller gigs, and larger ones where loud onstage sound is not required. I also use it in the studio for adding some oomph to a DI, far more satisfying and real than applying a bass amp sim after recording. 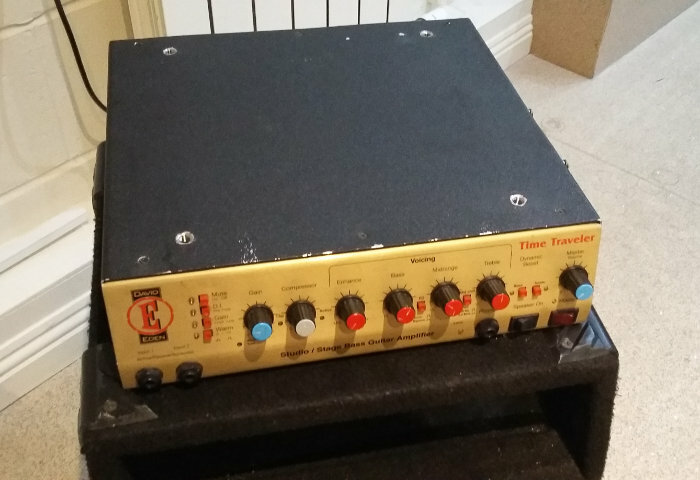 It was sold by Eden as a combo, but is actually a combination of two units, a modified cx110 speaker cabinet and WT330 Time Traveler bass amp. 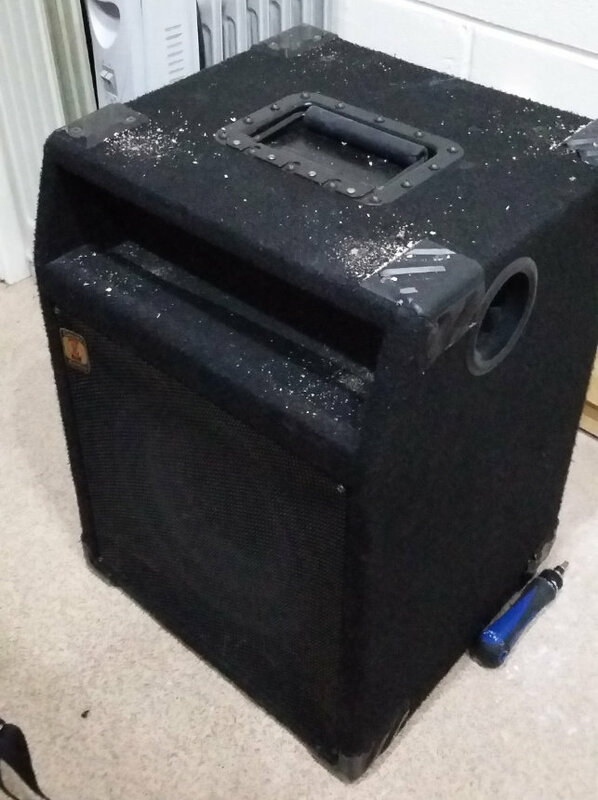 The amp goes in a gap at the top of the speaker, and can be easily removed by undoing 4 bolts. Four of the small washer type fasteners on the left should be attached to the top of the amp case, but had worked loose, no doubt encouraged by my frequent disconnecting of the amp from the cab. Bolts go through the cab into these, and are all that is between the amp and the pavement. After some thought I concluded that the design was good, but not strong enough for frequent disconnection, and sought larger replacements. But I had no idea what these things were called! 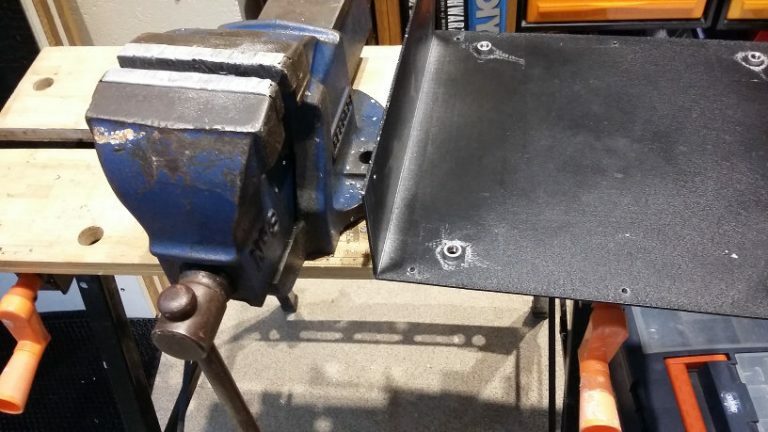 Turns out they are self clinching nuts, a really clever thing with a daft name that allows you put bolts into sheet metal too thin or soft to accept a thread. The new nuts & bolts are on the right, and have an M8 thread. They are really easy to install – just drill out the existing holes to a suitable size, and squeeze the nuts into the case in a vice. No glue required – through the power of metal cold flow they stick together, hopefully never to part again. And now, behold the lonesome sight of cabinet without amp, the aptly named “CXC 110 Airhead”. The silence is neither deafening nor golden. The sawdust is from where I’ve drilled out the existing holes in the top to accept the larger bolts. But no worries as along comes the amp with newly installed super threads!